After a random draw, congratulations to Mary W, the winner of the Best Places to Bird in the Prairies! Thank you to everyone who entered, and a special thanks to Josh at Greystone Books, for providing a copy of the guide. You can get your hands on a copy from Greystone Books just in time for spring migration on their website or your local birding store. 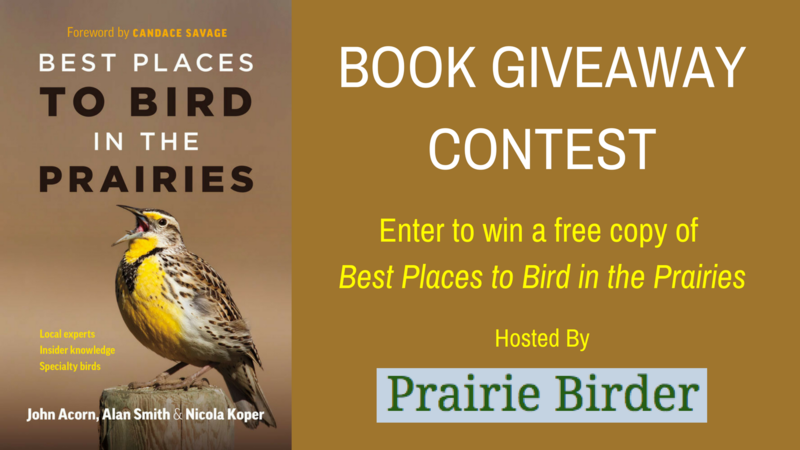 “Best Places to Bird in the Prairies” Giveaways! Good Canadian-specific field guides are few and far between, and those for the Prairies are even harder to come by. Greystone Books has begun to rectify this oversight by publishing a series of books for birders that focus on some of the best birding locations each province has to offer. The first guide in the series looked at British Columbia, and now the newest covers the top spots in the prairie provinces (Alberta, Saskatchewan, and Manitoba). 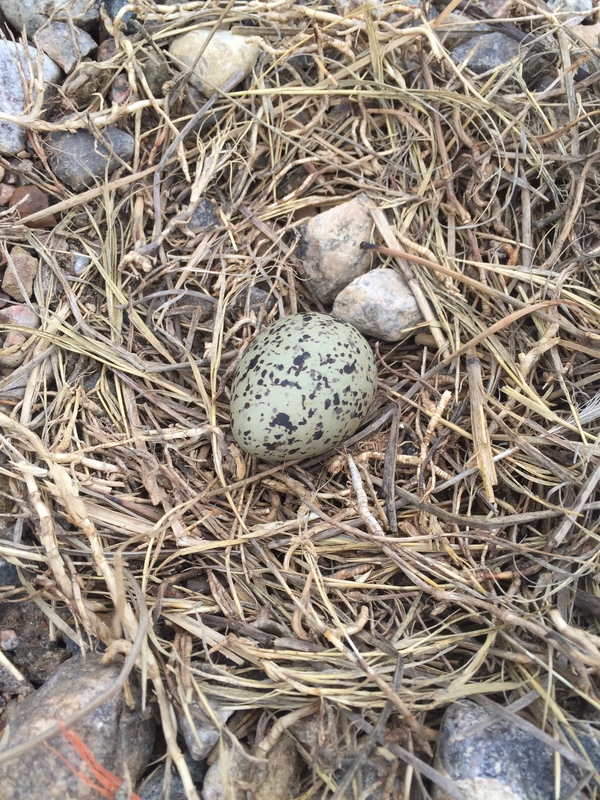 Best Places to Bird in the Prairies is a collaboration between experts from across the provinces: John Acorn from Alberta, Alan Smith from Saskatchewan, and Nicola Koper from Manitoba, who have unparalleled knowledge for their areas. Maps, detailed directions, and alternate routes for those out-of-the-way locations are provided, but the guide isn’t limited to remote sites; the locales featured are as diverse as the birds that inhabit them, ranging from urban to rural, easily accessible to not very. 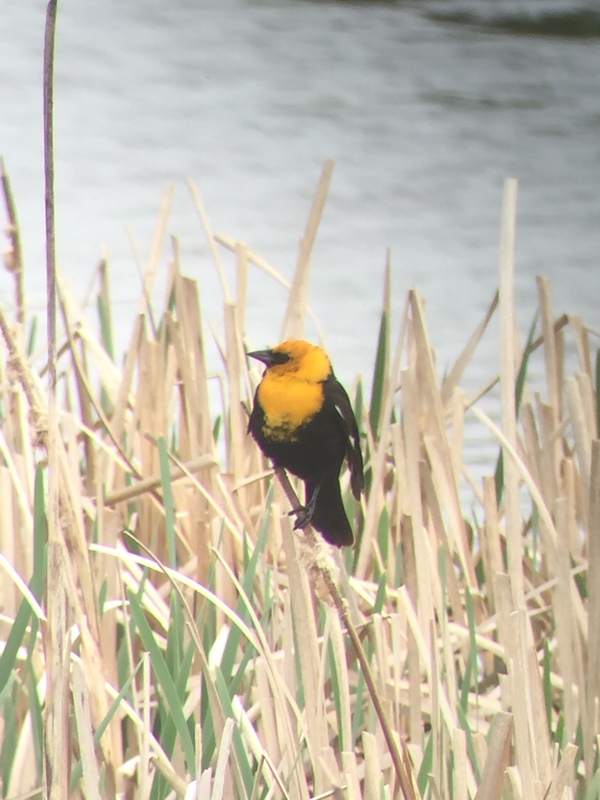 The guide helps beginning birders as well as those visiting from out of province and abroad to explore the incredible variety of avian species found across the Prairies, and will also guide experienced birders to see target species found only in certain locations. 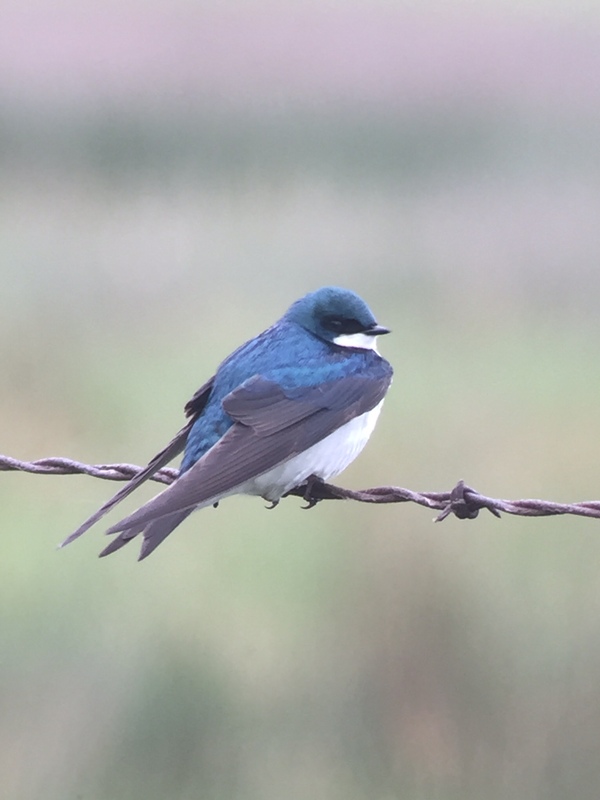 In Best Places to Bird in the Prairies, three of Canada’s top birders reveal their favourite destinations for spotting local birds in Alberta, Manitoba, and Saskatchewan. They highlight thirty-six of the region’s most highly recommended sites, each of which has been expertly selected for the unique species that reside there. With exclusive lists of specialty birds, splendid color photography, and plenty of insider tips for finding and identifying birdlife year-round, the book is accessible and easy-to-use—an indispensable resource that will inspire both novice and seasoned birders to put on their walking shoes, grab their binoculars, and start exploring. 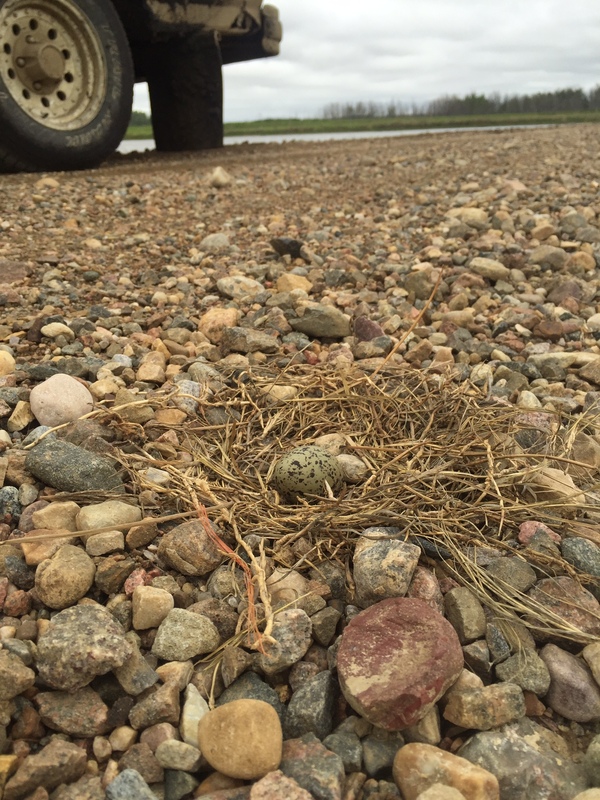 Eager to get your hands on the Best Places to Bird in the Prairies? Well, you’ve come to the right place! We have two copies of the new guide to give away, from this blog and also from the Alberta Birds Facebook Group; a big thanks to Josh at Greystone Books for making the giveaway possible. That’s two books we’re giving away, so check out the Facebook group for those contest details. 1. Please comment on this post below with your favourite birding location in either of the three provinces, or your favourite prairie species. 2. For a second entry, head over to my personal Facebook page Prairie Birder as well as to the Greystone Books Facebook page and “Like” them both. Please mention below in your comment that you have “Liked” them (if you’ve already liked our pages, that still counts!). The deadline to enter is Thursday, April 26th. After a random draw, I’ll announce the winner on Friday, April 27th. I just got confirmation a few weeks ago that I, along with nine others, will be attending the inaugural Young Ornithologists’ Workshop at the Beaverhill Bird Observatory (BBO) in Tofield, Alberta in early August. In contrast to my Long Point Bird Observatory workshop (2012) and internship near LPBO at The Tip (2013) in Ontario, I’ll be driving to Beaverhill (which is about 90 minutes away), so I’ll be packing a little differently; here’s my packing post from 2013. Since I’ll be a Team Leader at BBO as well as a participant, I thought a packing post might be helpful for some of the young birders and anyone else who might be attending a similar birding or naturalist workshop, especially those who might not have camping experience or who might be looking for new camping gadgets and gear. My first piece of advice is to pack light, but pack smart. There’s nothing more frustrating than overpacking and then having to haul everything, especially the unnecessary items, around. Especially if the trip is short, keep your packing list to a minimum. Don’t bring your best clothes. Bring things that can get dirty and possibly even ripped or torn (think thorns, branches, and maybe barbed wire fences) and think layers, no matter what the season. In Alberta, even in the summer the early mornings and evenings can be cool, and extra layers are also helpful against mosquitoes and ticks. Polyester and other fast-drying tops and bottoms (including underwear and socks) are great if you need to wash anything. I’m also going to bring my microfiber towel that absorbs a lot of water but dries quickly; my mother found it on Amazon.ca. AT BBO, there’s the possibility of going on the water and maybe swimming during the workshop, so don’t forget to bring a swimsuit. Bring some warmer layers just in case — a fleece top, heavier socks, a winter hat, a neck gaiter, and a light pair of gloves. Inexpensive nitrile garden gloves are good; they’re waterproof and give you a good grip for binoculars and cameras. My mother swears by the selection, quality, and price at Peavey Mart/Main Street Hardware stores. I like wearing baseball caps for rain and sun and have a variety from the Long Point Bird Observatory and Cornell Lab of Ornithology; besides the protection they offer, their sale supports bird conservation organizations. However, especially if you have shorter hair, ball caps don’t provide a lot of shade protection for ears or the back of the neck, so you might want a hat with more coverage. Bonus points if your shoes or boots are waterproof or water resistant, especially if you’ll be spending any time in the mud. In addition to a pair of lightweight, waterproof hiking boots, especially if you’re travelling by vehicle, I’d recommend tossing a pair of rubber boots in the trunk, just in case. The boots I wear almost year-round, except in the coldest winter weather, are women’s Ropers, which are leather with a forged steel shank and double-stitched seams; you can buy them at UFA farm supply stores in Alberta, or at Lammle’s western wear. They’re not waterproof though, and they can be heavy, so I ‘ve been considering a new pair of Keen hiking boots. And I will put in a plug for Smartwool or Thorlo socks. As for bottoms, I usually wear jeans instead of shorts because of ticks, mosquitoes, thorns, and the possibility of barbed wire. However, since my 4H NWT trip last summer, I’ve become a fan of MEC ripstop nylon convertible pants — they’re light, breathable, easy to wash and fast to dry, convert to shorts when needed, fit well, and very comfortable. And lighter than jeans. You can find them made by different companies, including (I believe) Columbia, which you can find at sporting goods stores, such as Cabela’s, Bass Pro, and Sport Chek. Temperatures in Alberta are cool at night even in the summer, so bring a sleeping bag that is rated for a pretty low temperature. Sleeping on the ground can be uncomfortable, so an air mattress or a sleeping pad makes for more restful sleep. For the NWT trip last summer, I was going to take a pad but at the last minute borrowed an old air mattress from my aunt and uncle. The mattress inflated with a pump which wasn’t that much work, but the self-inflating mattresses others had were better — lighter and much less to carry. My mother just bought a lower priced MEC reactor sleeping pad for my brothers and me to use this summer, and it seems pretty comfortable. Don’t forget a pillow and maybe a small extra blanket (preferably fleece/microfibre in case it gets wet). I’m not going to mention much here because everyone has particular preferences. I have fair skin and burn if I’m not careful, so sunscreen is imperative. And bug spray! Of course, soap and shampoo (and possibly conditioner), but if water access is limited, dry shampoo works very well; brands I’ve found that work well and can be found easily are Batiste, Not Your Mother’s, and Aveeno dry shampoos. Baby wipes can also come in handy for a variety of uses when water is in short supply; and a washcloth or two for when water is available (microfiber rather than cotton, so it dries quickly — if you can’t find them in the bath department, look in the household cleaning section.) Less is definitely more when it comes to toiletries. Also, try to avoid any highly scented products to help keep the mosquitoes away. Water bottles are a necessity and if you aren’t flying, bring a few extras and fill them at home before you leave. Since we’ll be camping for a week, bring a small amount of any medicine/first aid items you’d like to have on hand: bandaids, Advil or Tylenol, Vitamin C for a sore throat, Tums, antibacterial ointment like Polysporin, tweezers for tick removal, antihistamine tablets (like Benadryl) in case of allergic reactions to plants or insects, and so on. This will be my first time camping with a phone, and since we’ll have limited electricity, I’m bringing a car charger, our Eton BoostTurbine Portable Charger with a hand crank, and a solar charger. At Long Point we woke before sunrise to set up the mist nests and in retrospect, a headlight instead of just a flashlight would have been very helpful. My youngest brother swears by headlamps for chores in the winter; he has a Fenix HP 300 as well as a Boruit (5000 lumens). The Boruit is fairly inexpensive and available from Amazon.ca. Decide how much light you need or want, and how much you’re willing to spend. I would also recommend at least a pocket knife, or a Swiss Army knife, Leatherman, or similar multi-tool. A small backpack for day trips is useful, especially if you’ve packed everything else in a larger pack. Binoculars are a must, but if you don’t have a pair, ask around and you may be able to borrow some from a friend or acquaintance. If you’re searching for any items, consider posting to your local birding listserv as many members are willing to help young birders. If you have a spotting scope, it can be a great piece of equipment to bring. While it can be bulky, the views of far-off birds are all worth the weight. If you don’t have a scope, though, don’t worry. Most bird observatories have one and will lend it out to the young birders attending the workshop or camp. Notebooks are an easy way to keep track of your notes, observations, and sketches — I learned at Long Point that if it isn’t written down, it doesn’t count! Bring pens, pencils (small Ikea pencils are great! ), coloured pencils, a pencil sharpener (or penknife), erasers, and notebooks. BBO will supply notebooks (Long Point did as well), but if you like Rite-In-The-Rain notebooks, you can find them at Peavey Marts in Alberta. Decide before you start to pack if you really want to carry your camera around everywhere, and whether you’re going to take lots of photographs or just the occasional snap. This will affect what you pack. If you are bringing anything that needs batteries, bring extra batteries and/or make sure that your batteries are fully charged before leaving home. Also bring enough, or extra, empty SD (memory) cards. You might also want to bring a new clean plastic bag for your camera and/or scope in case you’re out all day in the rain. This might sound counter-intuitive for a stay at a bird observatory, but I suggest not bringing a field guide, since they’re usually heavy and most observatories have a shelf of field guides available to use. You might also want to consider some field guide/birding apps, which you can download to your mobile device before you get to the workshop. I recommend the eBird Mobile app (free iTunes and Google Play), Birdseye North American (free), Merlin Bird ID (free), Bird Codes (free), and the Sibley eGuide to the Birds of North America ($19.99). 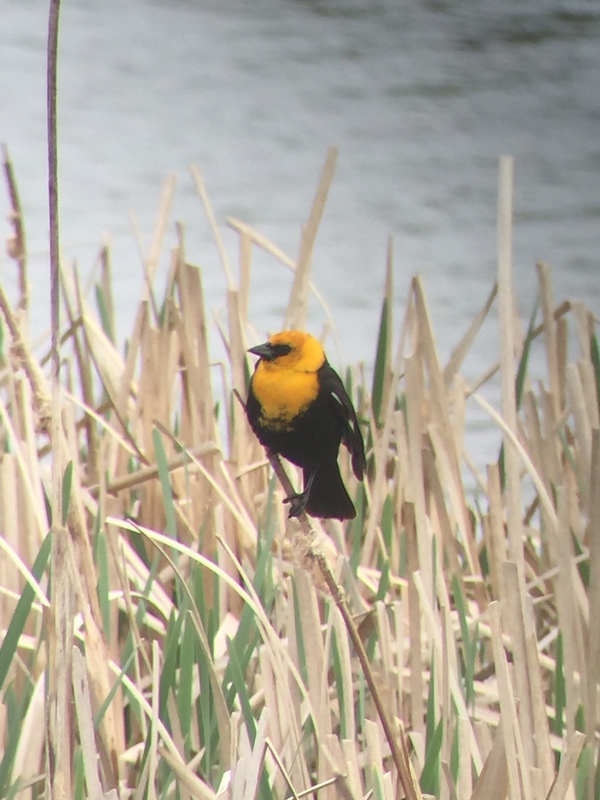 For more about birding apps and birding with your phone, here’s a post I wrote earlier this month. I’d also suggest a variety of plastic bags, from smaller Ziploc bags for toiletries to larger garbage bags (the clear kind are good for scopes) for your backpack, scope, sleeping bag, and delicate electronics that should be kept dry. If I’ve missed anything, or you’ve found something to be very useful for birding/nature camps or workshops, please leave a comment below. 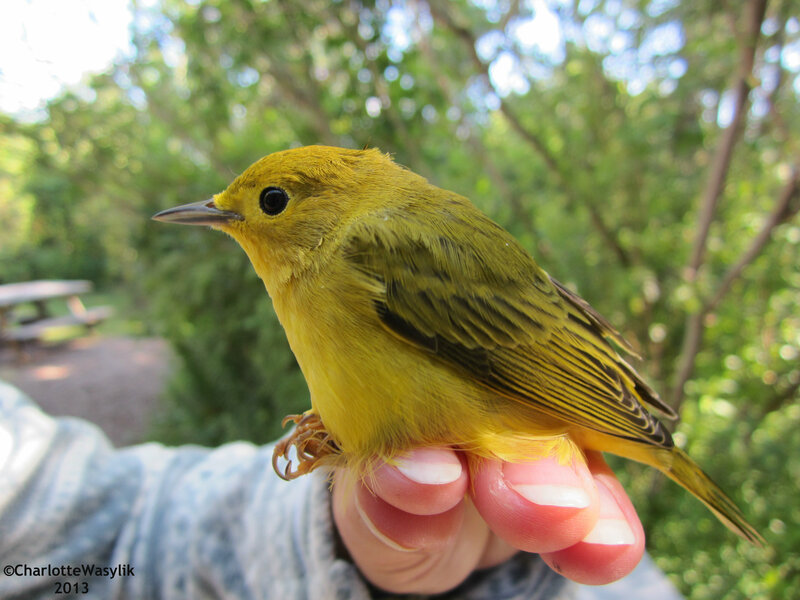 A Yellow Warbler we banded at LPBO ,and I imagine that we’ll be banding many of them at BBO too! I photographed this female Wilson’s Phalorope the other day as I was trying to photograph the Cinnamon Teal, but the phalaropes were more accommodating! 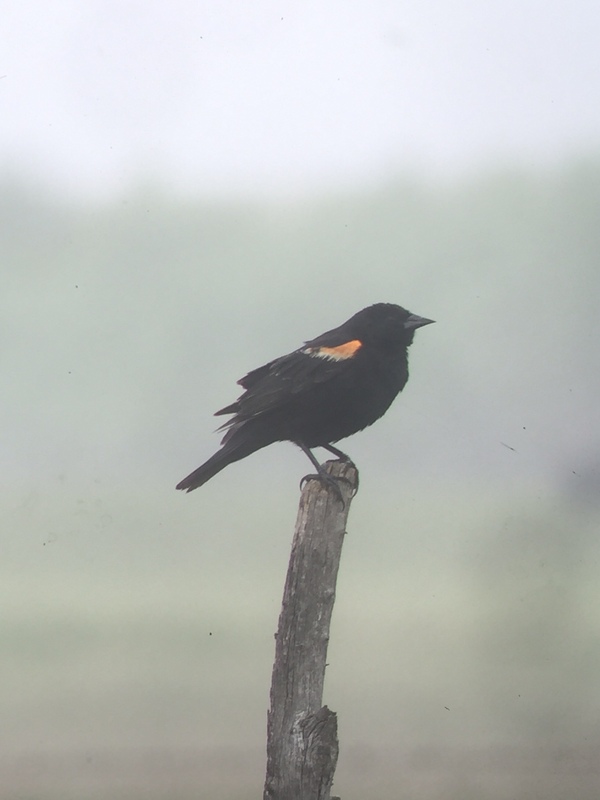 My 2016 Great Canadian Birdathon was Monday, May 23rd. 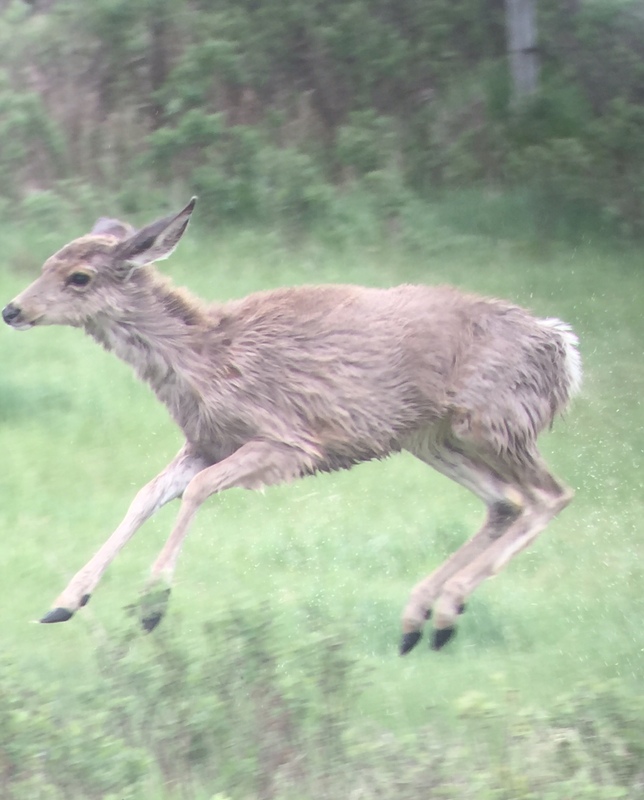 Armed with my scope and phone, I digiscoped all the photos I took during the day, though I wasn’t able to photograph every species I saw. Tree Swallows were the first species to make the list and just standing outside our front door at 6 am I could hear Sprague’s Pipits, Western Meadowlarks, Killdeer, and an American Robin. I started off scanning the mudflats at the slough across from our house where I was able to find Killdeer, American Avocets, Semipalmated Plovers, Semipalmated Sandpipers, White-rumped Sandpipers and a few Baird’s Sandpipers. Another flock of peeps flew in just a few hundred feet away, so getting closer I found a Stilt Sandpiper (FoS) and a Spotted Sandpiper. Along with all the sandpipers, there were Northern Shovelers, Blue-winged Teals, and Buffleheads on the slough. I walked over to the woods and I added Baltimore Oriole, Song Sparrow, Least Flycatcher, American Redstart, Common Yellowthroat (FoS), Warbling Vireo, Le Conte’s Sparrow, Red-eyed Vireo, European Starling, and Eastern Kingbird (FoS). It started to rain very gently, but the birds didn’t seem to be affected by it. I stopped at the house for more breakfast and an opportunity to watch for the Ruby-throated Hummingbird that had been frequenting our window feeder for the past few days. The female hummingbird showed up shortly after I sat down at the kitchen table! I walked south behind the house to Indian Lake to look for loons and other passerines. I hadn’t been at the lake at all this spring for actual birding and I was surprised to see how much water the lake is holding. There is no longer a shoreline and the water has reached into the woods. Other than Buffleheads, Blue-winged Teals, and lots of Eared Grebes, I didn’t find any new species. I did hear some warblers “chipping” in the trees, so I followed the vocalizations away from the lake. In the trees I saw more American Redstarts and Magnolia Warblers, Clay-coloured Sparrows, and a Lincoln’s Sparrow — a new species for the day. I was just about to leave the woods when I heard a Rose-breasted Grosbeak singing. 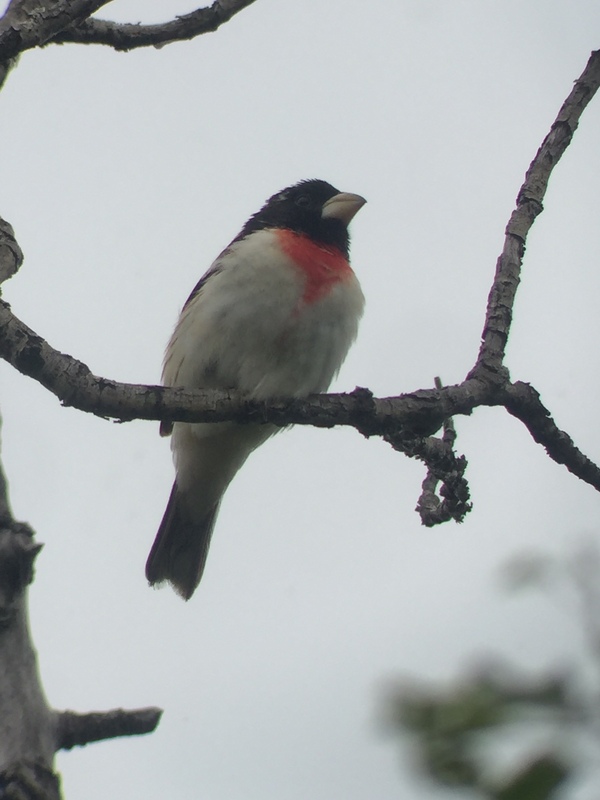 I had never seen a grosbeak on any of my previous Birdathons before, so it was a really exciting to see not just one, but two! 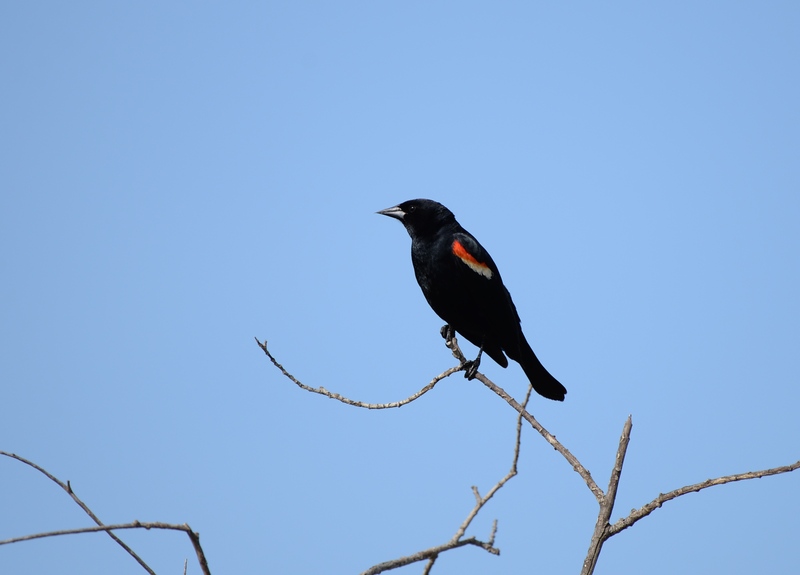 I drove over to our farmyard where I found Brown-headed Cowbirds, Yellow-headed Blackbirds, Vesper Sparrows, and Black-billed Magpies. Two male Cinnamon Teals have been feeding in a little slough near our house everyday for weeks, but as I drove to the farm yard they were absent. I did my morning chores and then drove around to the next township road where the slough crosses the road. 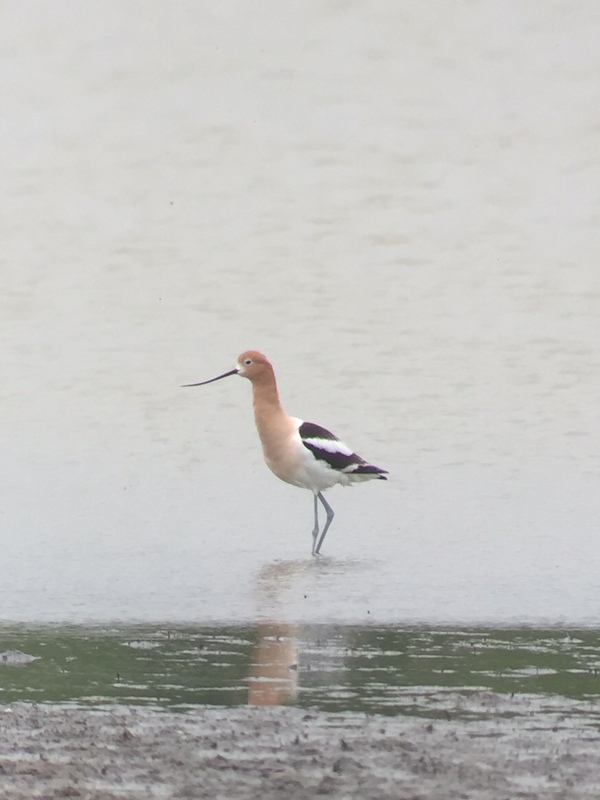 There were American Avocets all over the road and my suspicion that there were nests around was correct. 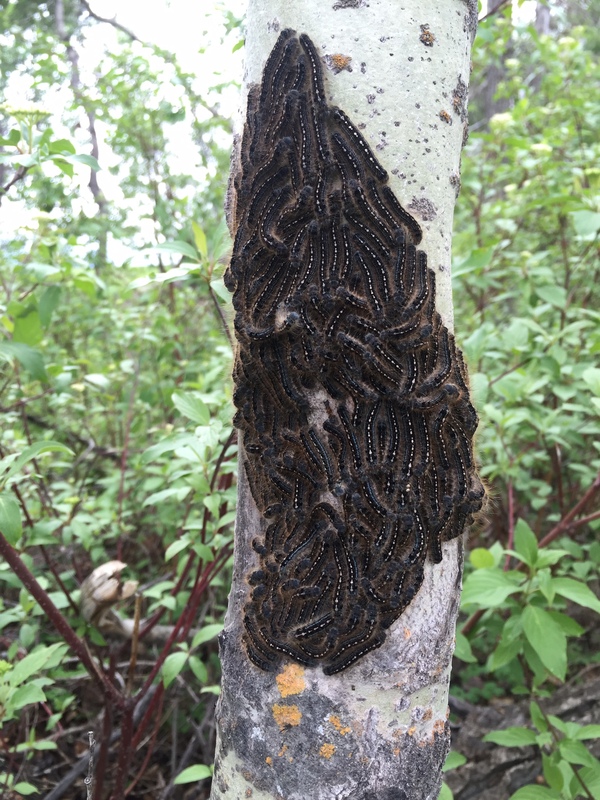 There were multiple nests on the road and others on the edge of the slough. 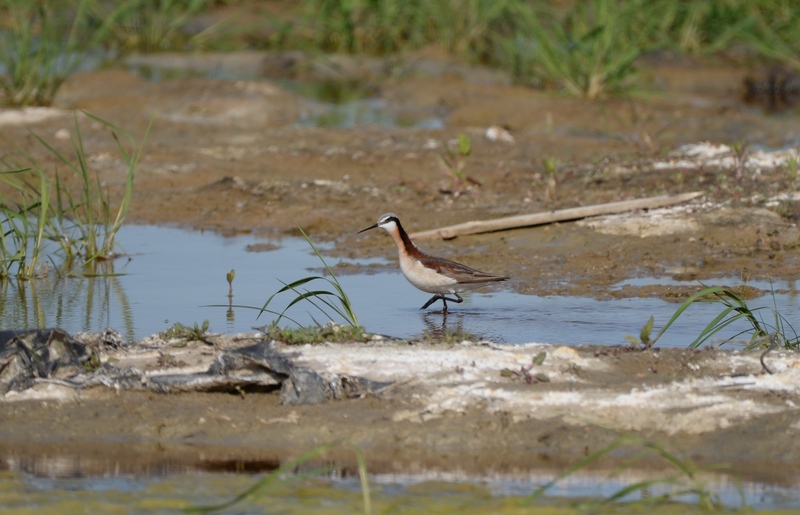 More shorebirds landed nearby and there were two new species in the flock, Least Sandpipers and a Red-necked Phalarope. I was still missing a few species such as Ring-necked Ducks, American Coots, and Pied-pied Grebes but found them at another slough down the road. Lunch time was rolling around and back at the house I decided to try again for the teals and there they were, and a Mountain Bluebird on the barbed wire fence to boot. After lunch I drove to my grandparents’ yard after lunch where I was expecting to find some particular species. 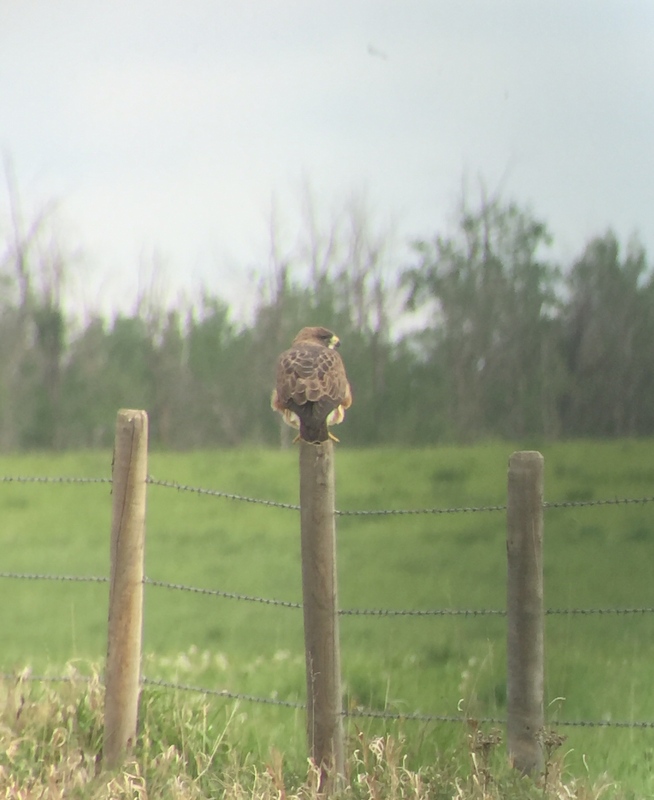 On the drive over, there was a Turkey Vulture soaring over the road, with a Swainson’s Hawk below it on a fence post, and an American Kestrel sitting in a snag. I found Pine Siskins, an Eastern Phoebe, and Yellow-rumped Warblers in my grandparents’ yard. 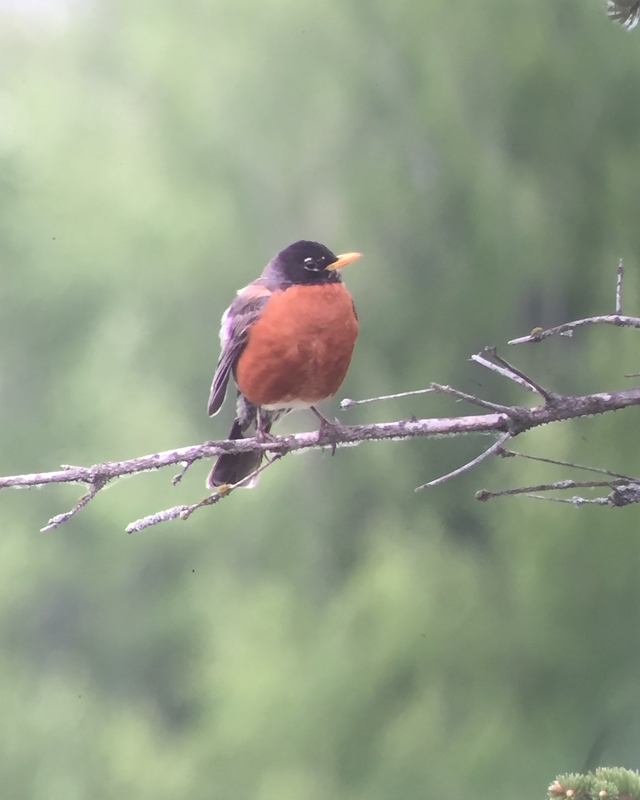 From their yard I birded the Vermilion Provincial Park — a Great Blue Heron, Double-crested Cormorants, and Purple Martins helped my list grow. I continued birding throughout the afternoon picking up new species here and there. It was getting later in the evening, and as I counted the species on my list I realized I was very close to 100 species for the first time ever in my Birdathon. There were still a few species I could try to find and one of those was Common Grackle. We have some land 12 kilometres north of our house where there’s a slough surrounded by lots of mature trees — it gives the impression of a Boreal Forest slough. There was a Common Grackle singing on there other side of the slough and I heard a Ruffed Grouse drumming on a log. There are occasionally some Snow Geese hanging around on the larger sloughs in the area and though I didn’t see any at the first one, after scanning the far shore of the second I did find a lone Snow Goose mixed in with the Canada Geese. 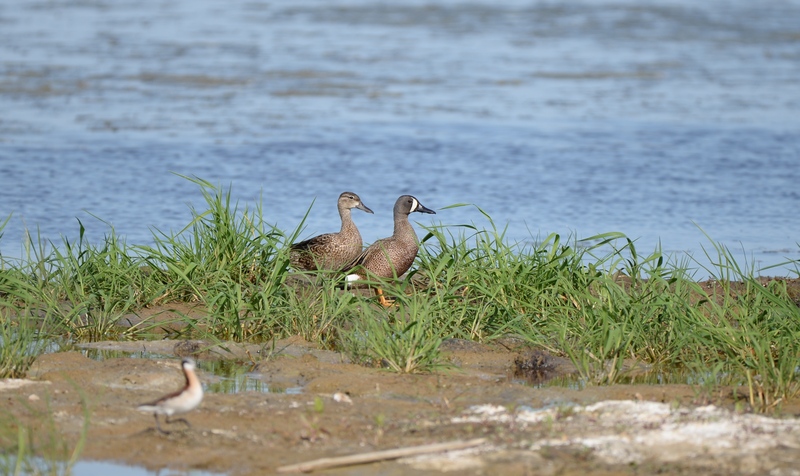 Wilson’s Phalaropes were MIA all day but I finally found two females a few kilometres west of the large slough. The last species of the day was a Veery at our farm yard which was my last stop for the day. 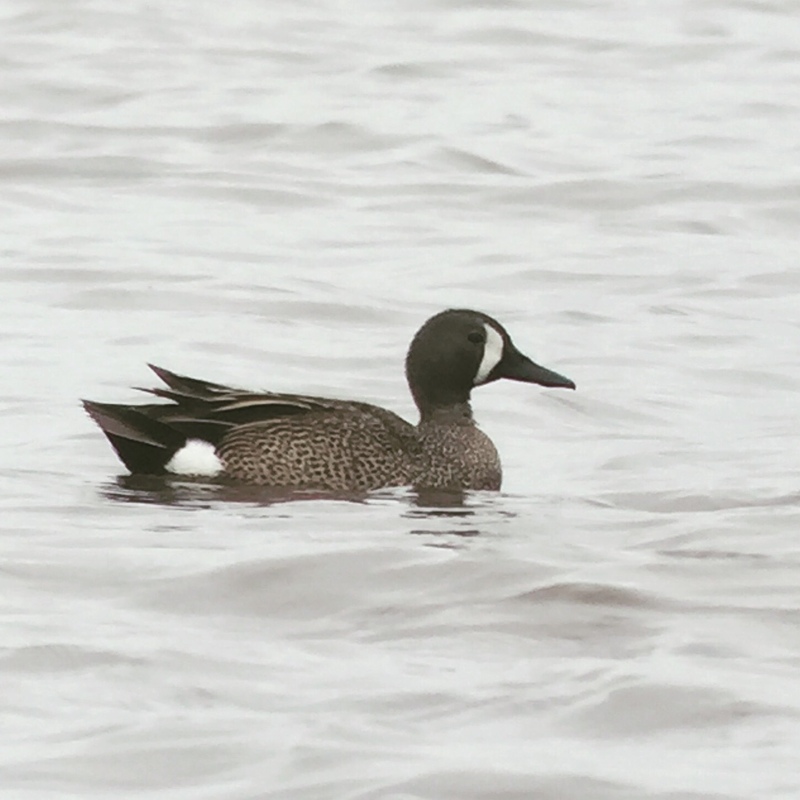 Altogether my Birdathon was excellent and I tallied 102 species (I originally tallied 101 species, but noticed when writing this blog post that I had mistakenly omitted Northern Pintail on the list). My goal for the Birdathon was $1,575, with my funds earmarked for the Calgary Bird Banding Society and Bird Studies Canada. I’ve received great, generous support and generosity from birders across North America, raising $1,205 so far. Thank you very, very much to everyone who has supported my Birdathon this year — I greatly appreciate all of the donations and encouragement. If you’d like to add more to my total for the worthy cause of bird conservation (as a reminder, donations over $10 are tax deductible), you can visit my team page. Pied-billed Grebe, Horned Grebe, Red-necked Grebe, Eared Grebe Double-crested Cormorant, Great Blue Heron, Snow Goose, Canada Goose, American Wigeon, Mallard, Blue-winged Teal, Cinnamon Teal, Green-winged Teal, Northern Shoveler Northern Pintail, Gadwall, Canvasback, Redhead, Ring-necked Duck, Lesser Scaup, Bufflehead, Common Goldeneye, Ruddy Duck, Turkey Vulture, Northern Harrier, Swainson’s Hawk, Red-tailed Hawk, American Kestrel, Merlin, Gray Partridge, Ruffed Grouse, Yellow Rail, Sora, American Coot, Semipalmated Plover, Killdeer, American Avocet, Willet, Spotted Sandpiper, Semipalmated Sandpiper, Least Sandpiper, White-rumped Sandpiper, Baird’s Sandpiper, Stilt Sandpiper, Wilson’s Snipe, Wilson’s Phalarope, Red-necked Phalarope, Franklin’s Gull, Ring-billed Gull, California Gull, Black Tern, Rock Pigeon, Ruby-throated Hummingbird, Yellow-bellied Sapsucker, Northern Flicker, Least Flycatcher, Eastern Phoebe, Eastern Kingbird, Warbling Vireo, Red-eyed Vireo, Black-billed Magpie, American Crow, Common Raven, Purple Martin, Tree Swallow, Bank Swallow, Barn Swallow, Cliff Swallow, Black-capped Chickadee, House Wren, Mountain Bluebird, Veery, American Robin, American Pipit, Sprague’s Pipit, European Starling, Tennessee Warbler, Yellow Warbler, Magnolia Warbler, Yellow-rumped Warbler, Blackpoll Warbler, American Redstart, Common Yellowthroat, Chipping Sparrow, Clay-colored Sparrow, Vesper Sparrow, Savannah Sparrow, Le Conte’s Sparrow, Song Sparrow, Lincoln’s Sparrow, White-throated Sparrow, Lapland Longspur, Rose-breasted Grosbeak, Red-winged Blackbird, Western Meadowlark, Yellow-headed Blackbird, Brewer’s Blackbird, Common Grackle, Brown-headed Cowbird, Baltimore Oriole, Pine Siskin, American Goldfinch, and House Sparrow.